Jesus spoke frequently of God's mercy, forgiveness and our need for repentance. No story in the Hebrew Scriptures better illustrates this than the story of Jonah. Jonah the Prophet was sent by God to Nineveh, to call on them to forsake their evil ways and repent. Jonah (after famously fleeing and being brought back on track by a whale) does as he is commanded and Nineveh actually repents, turning to God in true and genuine repentance, seeking forgiveness for their sins. In this parable of God's mercy, Jonah, now a successful prophet, is furious with God, because he believes he was made to look like a chump for calling down God's wrath. He complains to God that, "I knew that you are a gracious God and merciful, slow to anger and abounding in steadfast love" and that he KNEW that God would be merciful to them if they repented from their sins (Jonah 4:1.) And Jonah was correct. The story of Jonah, like the ministry of Jesus, illustrates God's unlimited mercy and forgiveness. Both are available to us when we repent of our sins and choose to follow God's path of Righteousness instead. The men of Nineveh were held up by Jesus as examples for those in Judea who were acting in unrighteous ways. God asks Jonah after his outburst, "Is it right for you to be angry?" (4:4) And it's a good question, and one that's still relevant. Because like Jonah, some modern Christian leaders are very angry with God for being too generous with His mercy and forgiveness. The truth is, God is not bound by OUR ideas of Justice and Condemnation. In this sense, God's ways are surely not OUR ways. 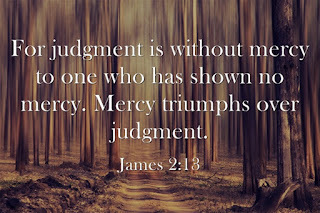 While we may decide that some people do not deserve God's mercy, and must first "pay a price" for falling short of His high standards, God does not condemn based on our whims or theories about who is "in" and who is "out" of his loving embrace, either now or eternally. And in the same way, one minor flaw in our character, one falling short of God's perfect way does not condemn us to eternal separation from God, as some today would imagine it. Jesus says we are forgiven when we repent and turn back to God, just as all the Hebrew Prophets before him promised. But wait - can God just show mercy to us - without retribution or payment? Just like that? Yes. God isn't the elected leader of a government we created, nor is He bound by rules we think He must follow. No one should say, "God cannot show mercy because He is bound be laws to be unmerciful." or, "We must pay a price before we get mercy from God." 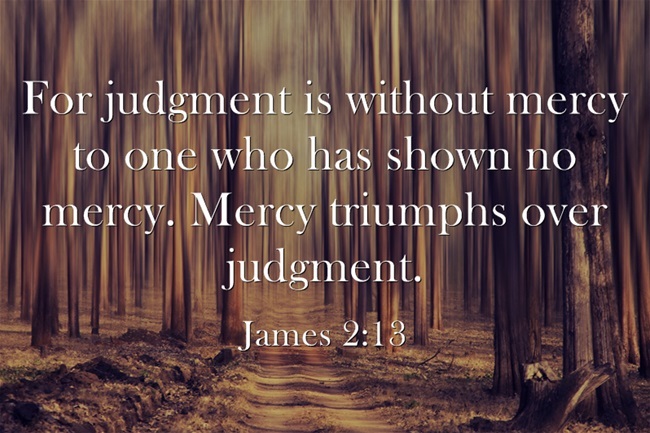 No, God's mercy transcends His judgment, when we repent with a pure heart and genuineness. All the Hebrew Scriptures and our Master, Jesus, testify clearly to the wonderful Truth that God's mercy is unlimited. The Hebrew Bible, consistent with the teachings of Jesus, tells us we may ALL return to God when we forsake evil and turn back to God's holy path of Righteous living. We are blessed to know a God Who does not curse us with other's sins, and Who freely grants mercy to the repentant! Having received the mercy of God, we are called by our Master, Jesus to show mercy to others. We show in our service to others - the widow, the orphan, the hungry, the homeless, the destitute and the suffering - that we understand what God's mercy means to us. And because we have the example of this man, Jesus, who achieved God's Standard of excellence, we know we are capable of doing what God asks of us.